Mike Cox makes beautiful music. As owner of A String Instrument Repair, Cox labors 10 hours a day doing luthier repairs in Columbus, OH. "It takes a lot of concentration. You need a steady eye and hand. You have to be careful of what you're doing because you can't undo a mistake," he said. All of Cox's restoration work is done by hand. The tools he uses are the same type other luthiers, people who make stringed musical instruments, were using 100 years ago. "I do what I can," said Cox. "Stradivari didn't have power tools, why should I? I'm sure I could increase production (with power tools,) but then quality would slip. It's a nice feeling — almost like the wood is talking to me." Cox is one of only a handful of local artisans who restore stringed instruments full time. Since starting his business four years ago, he's seen a steady increase in demand. "People are losing the ability to do things with their hands," he said. "There are less craftspeople around today, even though there's a growing population of musicians." About one-third of Cox's business is violin repair. The other two-thirds is guitar repair and related electronics work. "There are very few repairmen who know how to handle how to handle old, delicate instruments. A hundred years is old for a guitar, but violins are just getting desirable at that age," he noted. Much of what Cox has learned about restoration evolved from his talent as a musician. At the age of four, Cox's mother enrolled him in violin lessons. By the age of 10, he made the move to his first guitar. "I had guitars that didn't play, so I'd go to the library or buy a book on how to fix them. I was always interested in working with wood. I guess I just had a knack for making things. As a young guitarist in the 1970's, Cox toured with several bands, including then-unknown songster/storyteller Jimmy Buffet. Rigors of the road, however, eventually led to a change of tune. 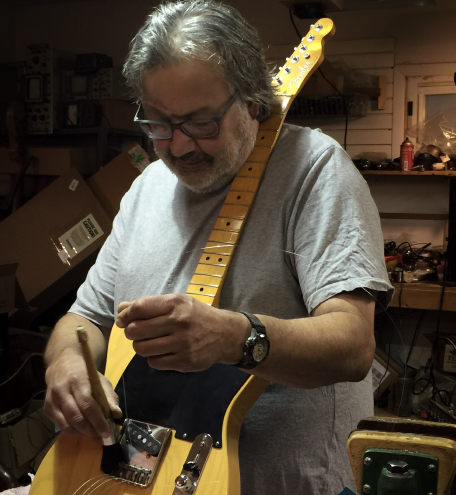 Cox's professional career in restoration and repair began in 1977, in a West Virginia music store, where he learned the basics of the trade from another craftsman. He later went on to work at The Loft, the only violin ship in Columbus, as well as consulting at Red Wing Vo-Tech, a trade school in Minnesota, which teaches violin and luthier repair. "I like my customers to feel good about their instruments. I've always felt that good instruments find their way to good players. It's a great feeling to be able to hear someone really good playing something I've fixed," explained Cox, whose list of clients includes Todd Rundgren and Jeff Cook of the band Alabama. In addition to restoration and repair, Cox also constructs violins. Using patterns and molds that date back to the 1500's, the painstaking process takes on average 75 to 100 hours to complete. "You have to be really precise. Sometimes I take apart old violins to find out why they're the way they are," he said. "The wood is really important. Most of the time it's just sheer luck." Razor-sharp tools and toxic chemicals are a few of the hazards Cox contends with on a daily basis. "I'm trying to get away from refinishing work. Even though there's a lot of ventilation and I wear a chemical mask, I know I'm still doing damage to my body." Cox also developed Carpal Tunnel Syndrome as a result of the repetitive motion associated with sanding and working with instruments. Even so, he remains true to his calling. "It gives me a sense of accomplishment to restore (an instrument) from start to finish," he said. "You have to take pride in it." Cox advises anyone interested in pursuing this career to research the craft and to gain experience working with wood. "I think you have to have a natural talent for fixing things," he said. "The big thing is you have to have a good ear as to what sounds right and what doesn't. Most good (instrument) repairmen are probably also good musicians." No matter what the future holds, Cox will do as he has for over 35 years — play it by ear. "I realize there's more money working for a company or playing instruments. But I'm a craftsperson first," he explained adding, "I'm very lucky to have a wife who supports me all the way. I couldn't do what I do if it weren't for her."